These fluffy and easy buttermilk pancakes are made with only 5 ingredients and require only 5 minutes prep work. So delicious and easy, a great way to feed a crowd. With just 5 simple ingredients and 5 minutes of prep, you can serve fluffy Easy Buttermilk Pancakes to a group — no flipping on the griddle necessary! 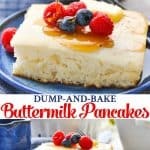 Perfect for a weekend brunch, a holiday gathering, or a simple weeknight dinner, these Dump-and-Bake 5-Ingredient Buttermilk Pancakes are the fastest and easiest way to feed a crowd! Plus, they’re freezer-friendly, making them a great way to prep ahead! That’s right — I’m bringing my favorite dump-and-bake cooking method to BREAKFAST! And not just any breakfast, but the best buttermilk pancakes! Whether we’re prepping weekday breakfasts for the kids, serving a special holiday brunch to guests, or throwing together an easy weeknight dinner for the family, buttermilk pancakes are always a hit. Unfortunately, I don’t serve them nearly enough because they just seem too labor-intensive. I don’t want to be standing over a stove for 20-30 minutes flipping enough pancakes to feed my ravenous boys. Plus, I always seem to burn at least half of them when I get distracted by the bacon, eggs, or orange juice that I’m also fussing with! Instead, I decided to bake my batter in a casserole dish for the ultimate Lazy Mom’s shortcut. And you know what? It turned out BETTER than I ever would have imagined! Moist, flavorful, thick, and fluffy — everything that I want my buttermilk pancakes to be! So Why Use Buttermilk To Make Pancakes? 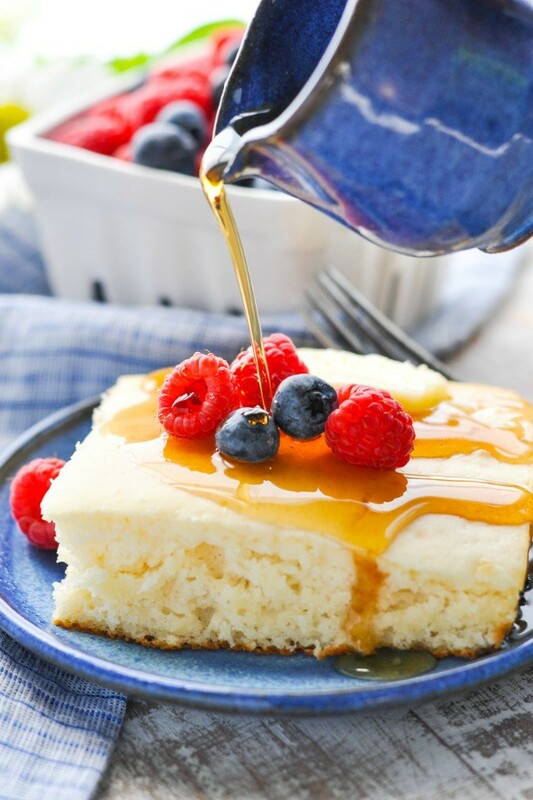 Buttermilk gives a delicious tangy flavor to pancakes and because buttermilk is acidic it helps leaven the pancake batter making them extra light and fluffy. 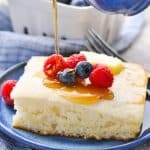 It’s the perfect way to make these dump-and-bake pancakes in the oven because there’s only 5 minutes prep, you don’t need to flip pancakes all morning and you still have perfectly baked, light and fluffy pancakes everyone will love! Not only is it a deliciously lazy shortcut, but the baked buttermilk pancakes are completely customizable! 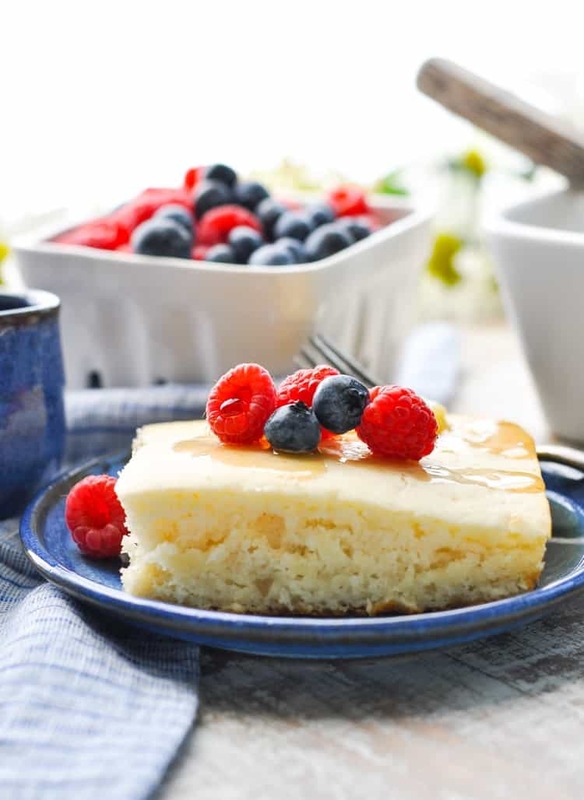 I use a basic batter and then let everyone at the table dress them up to suit personal tastes: butter (of course), maple syrup (of course), fresh berries, chocolate chips, powdered sugar, and whipped cream are all beautiful additions. Preheat oven to 425F/220C. Spray a 9 x 13-inch baking dish with cooking spray and set aside. Stir together all ingredients in a large bowl just until nicely combined (Bisquick, buttermilk, milk, egg, and oil). Batter will still be a little bit lumpy (and that’s fine) – don’t overmix or the pancakes will be dry. Pour batter into the prepared baking dish and bake, uncovered, for about 15 minutes or until cooked through in the center. 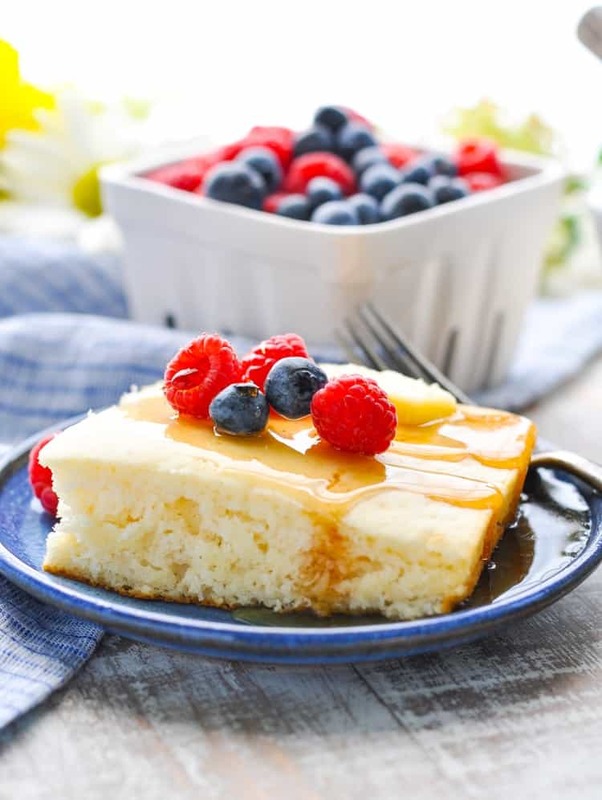 Slice into squares and serve with desired toppings! Cooking for a Smaller Family? 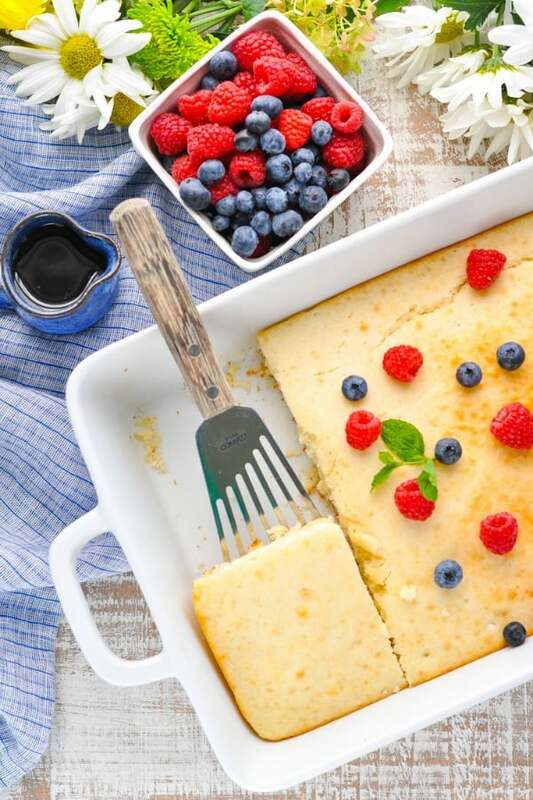 You can cut the ingredients in half and bake the pancakes in an 8-inch square baking dish. I would still use 1 full egg, since it’s tough to cut that ingredient in half. Baking time will be reduced by a few minutes, so keep an eye on the pancakes after about 10 minutes. Want to Prep Ahead? 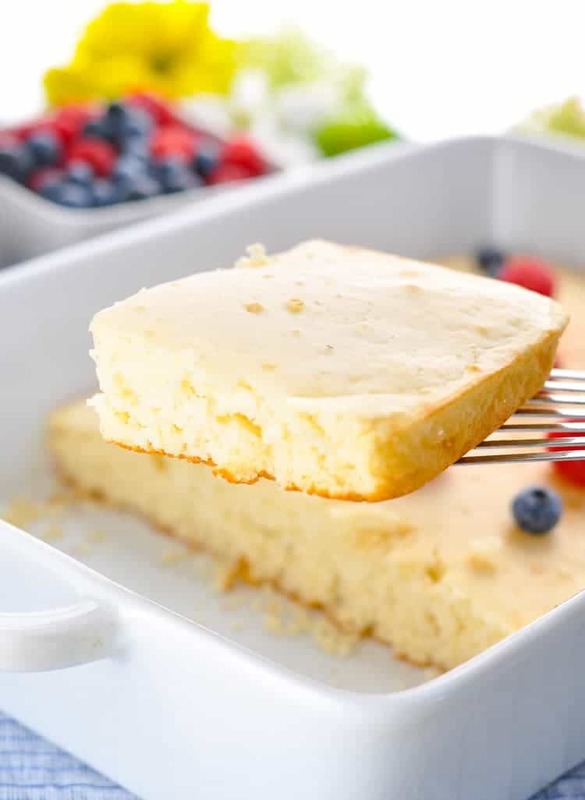 These can be frozen as an entire casserole before slicing, or in individual portions and reheated in the microwave for quick last-minute breakfasts! I love making pancake casseroles! They’re so easy and they definitely beat flipping pancakes over a hot stove, as I’m the worst at that! Love this five ingredient version. Sounds perfect for breakfast! Thanks, Kristy! They’re definitely a crowd-pleaser! Wow! This sounds great! This would be an easy breakfast for me every morning. I’m definitely going to make this. Exactly! Just prepare a batch and enjoy them whenever you need a quick option! Thanks so much, Deb! What a great idea. Would have never thought of doing this, but certainly am going to make some for the freezer for the holidays. Thanks for the recipe. That’s great, Judy! I hope that you enjoy the pancakes! I wonder if this would work with a protein pancake mixture … has anyone tried?? Hi Blair, I made the Dump & Bake Buttermilk Pancakes tonight for supper. Really good!! I sprinkled powdered sugar on top and then served them with maple syrup. Next time I will add fresh fruit and breakfast sausage on the side. I will definitely be making these again! Thank you Blair for all the great Dump & Bake Recipes. They are all so easy, quick and delicious!! Hi Blair, FYI, The Dump & Bake Buttermillk Pancakes is a 5 Star Recipe for me, not sure why it only shows 2 on the above comment I made a few minutes ago. Hi, I don’t live in the US and I can’t find the pancakes mix. Is there something I can use as a substitute? Thanks! I have made this by pouring half of the batter in the pan, Sprinkling cooked sausage and a ribbon of maple syrup, pouring the rest of the batter on top! YUMMMMY! That sounds amazing, Juju! Great idea! Blair you have nailed the best way to get ahead for breakfast! I feel now I can cook my eggs and bacon and also bake the pancakes in less time! How great is that…. My new son- in -law Loves breakfast. Love your new recipe I will be cooking the pancakes that way from now on .Thanks for sharing! Yay! It’s definitely the easiest way to prepare a batch of pancakes! 🙂 So glad that you enjoy them! Can you use Krusteaz pancake mix instead of Bisquik? Hello. Thanks for the recipe. I’ve never thought of baking it this way…I just used my tried and true pancake recipe and it was a nice change from flipping but it did take much longer to cook up…after 15-20 minutes it was definitely still very raw in the middle in my 9/12” Pan…not sure if the timing is wrong in the recipe?? Glad I tried…I will be making it this way again!